Geralt is coming to Soulcalibur VI, and that means that anything is possible. What other characters could be coming to the beloved franchises of your dreams? Fighting game crossovers are nothing new. I fondly remember fighting through Soulcalibur II on my original Xbox as the beloved Todd McFarlane creation known as Spawn, and I’ve even put a few hours into Street Fighter x Tekken so that I could find out what happens when Kazuya punches Akuma right in the face. In Injustice 2, you can put Superman up against Raiden from the Mortal Kombat games. This is the true power of video games. 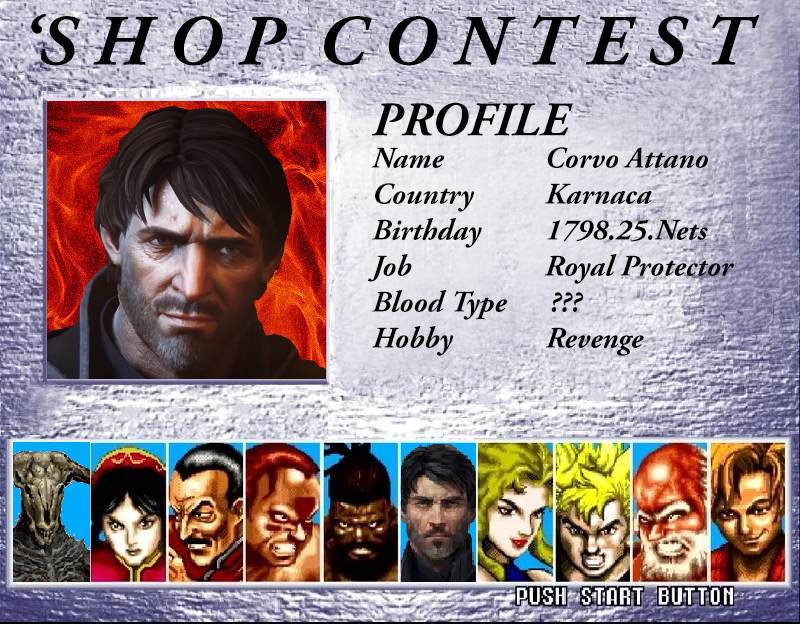 So this week’s ‘Shop Contest is all about using the power of your imagination to put new characters into fighting games where they did not exist before. As you can see in the header image I made, I have a deep love of the early Virtua Fighter games, and I would be fascinated to see what the wise (and teleporting) Corvo might do when paired up against Wolf Hawkfield, the professional wrestler who loves karaoke. Show me characters in fighting games who have never been there before. Give me amazing crossovers. Turn games that aren’t fighting games into fighting games. Special preference will be given to action shots (such as Soap MacTavish performing a perfect suplex on Luke Skywalker as he appears in Masters of Teras Kasi). Kotaku &apos;Shop Contest: Shadow Of The Tingle, Winners! Kotaku &apos;Shop Contest: Trick Or Treat, Winners!